Have your guest of honors name on our marquee in the V.I.P. loft. Think Chianti for your Celebrations! Private parties are our specialty. The chefs of Chianti excel in preparing dishes for intimate parties. Limited menus, Buffet menus, or our full menu are available in all of our rooms. 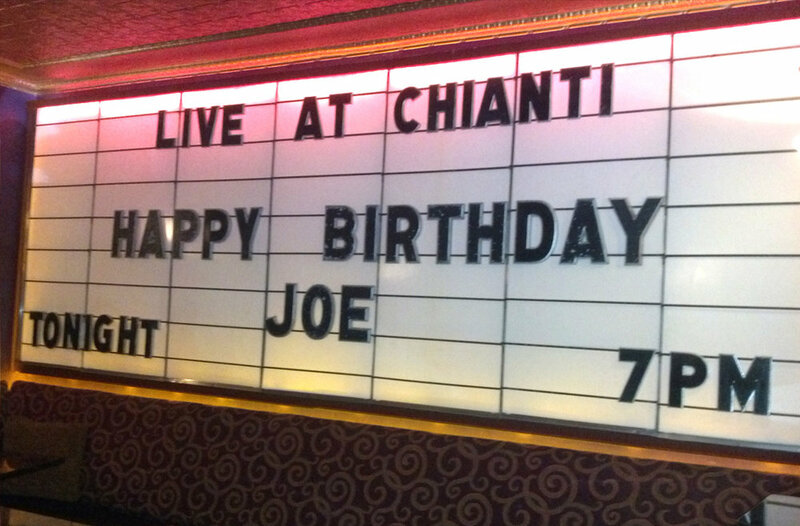 Chianti has five intimate dining areas available for your event. Each with its own unique, yet warm ambiance. Chianti’sTuscan Dining Room feels like you just stepped in off the streets of Florence. This room sits up to 40 people. The Atrium, which overlooks the patio, is perfect for parties up to 16 people. The Patio offers an outdoor, ‘al fresco’ experience, and seats up to twenty people. for up to 26 people. The Jazz Lounge serves parties of up to 40 people and has a stage for live music or presentations. Chianti is happy to customize your event to any dietary or budgetary needs. We want to serve you, and would be honored to host your event.